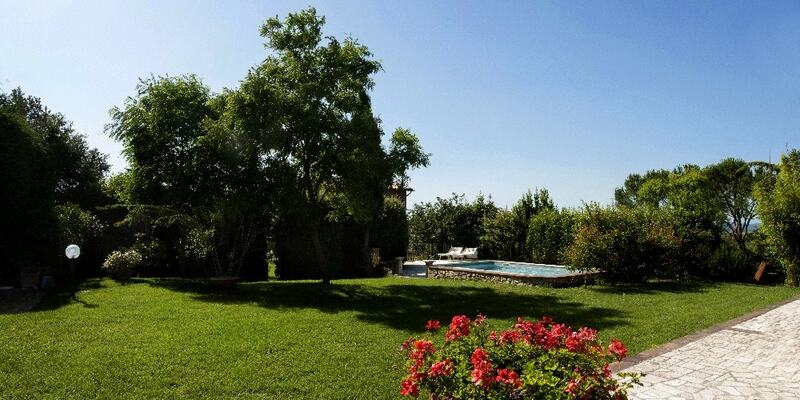 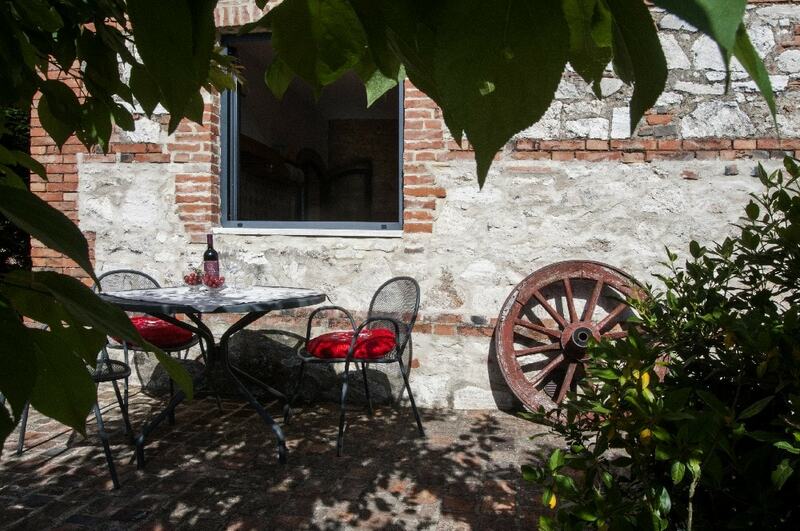 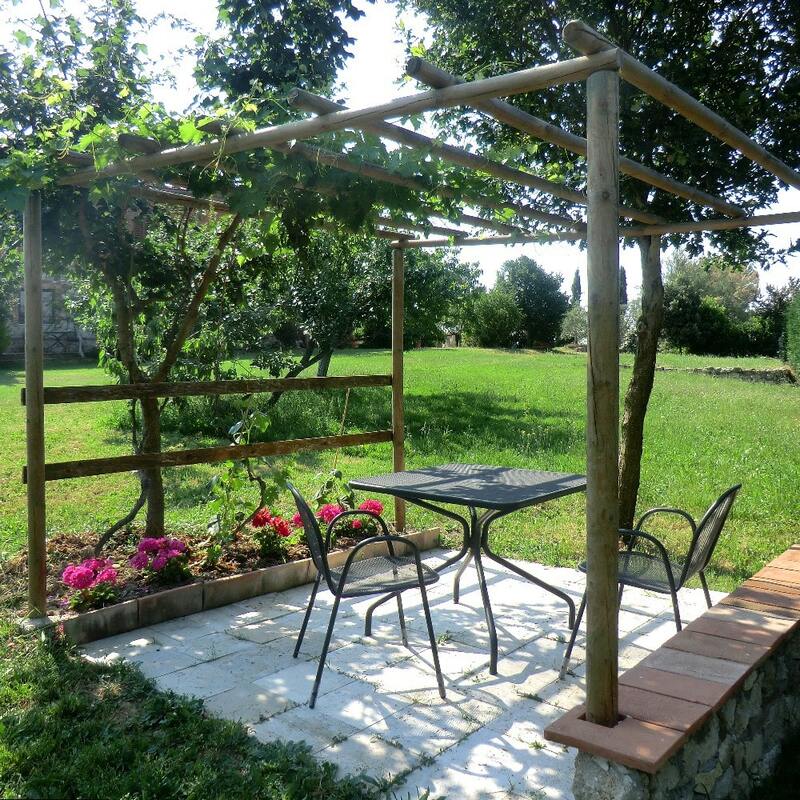 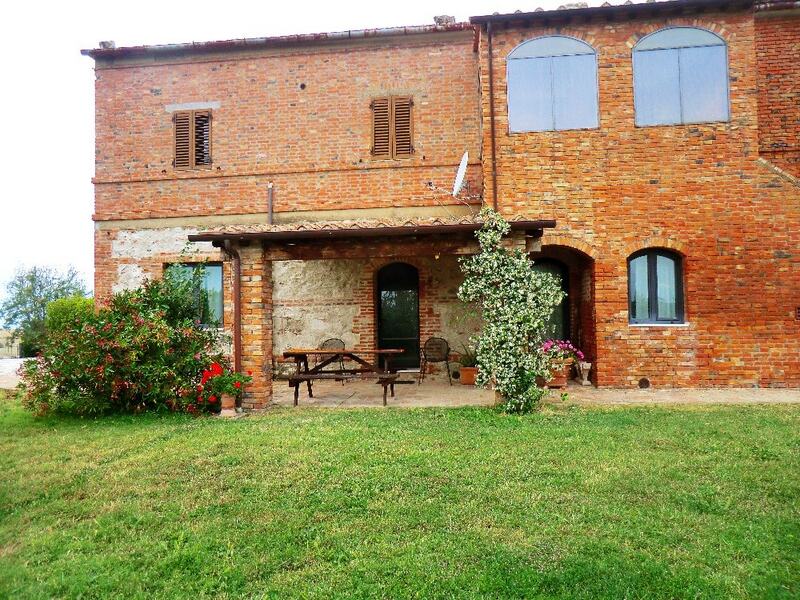 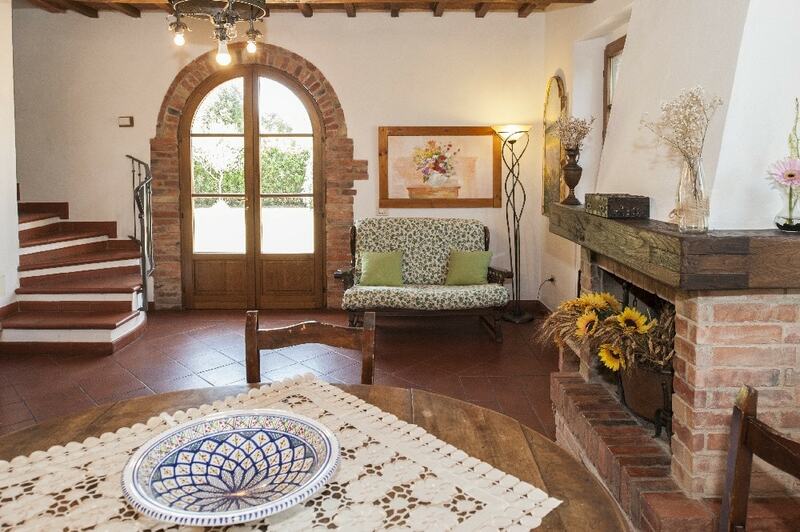 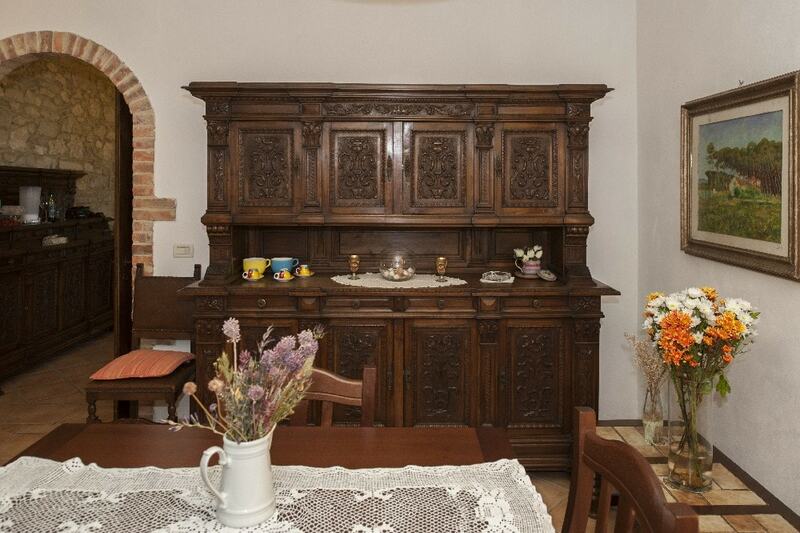 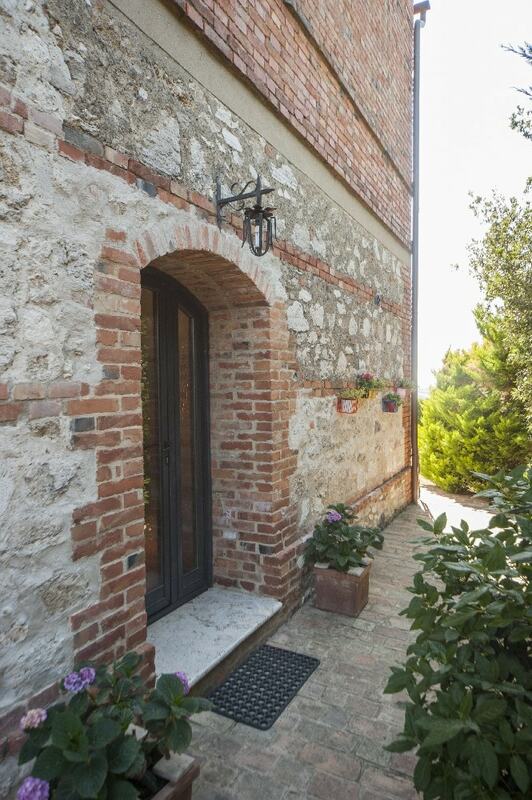 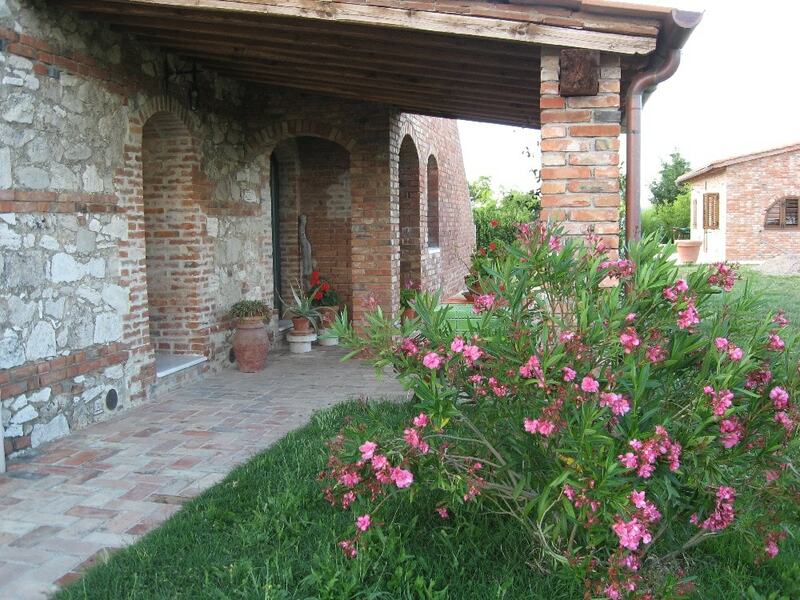 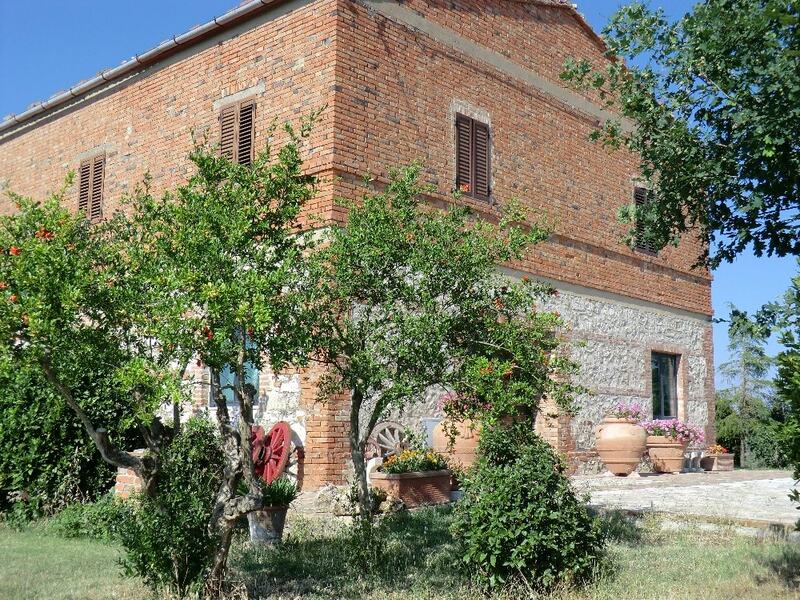 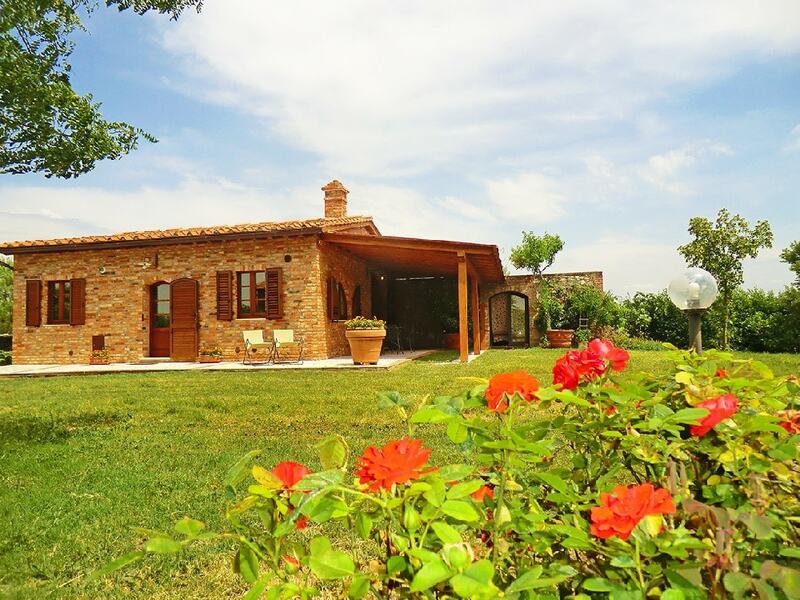 The ‘Podernuovo Holiday Farm’ is 5 km away from the medieval village of Asciano. 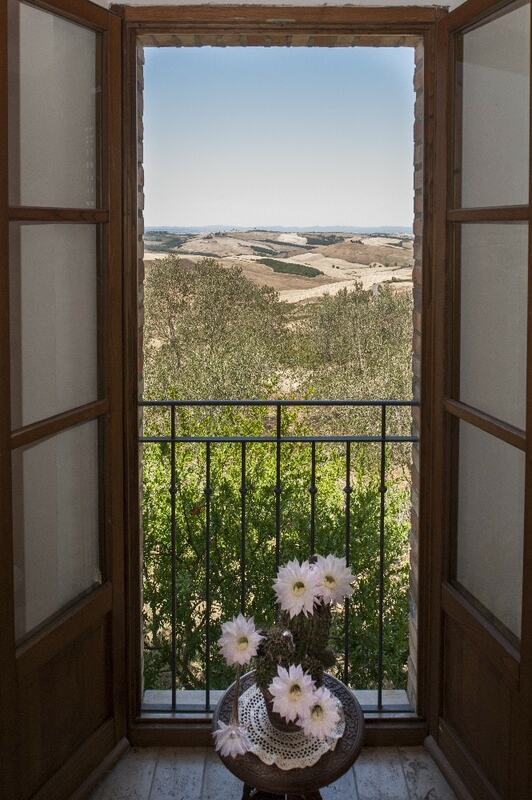 Positioned on the hills, it offers unique views over the ‘Crete Senesi’. 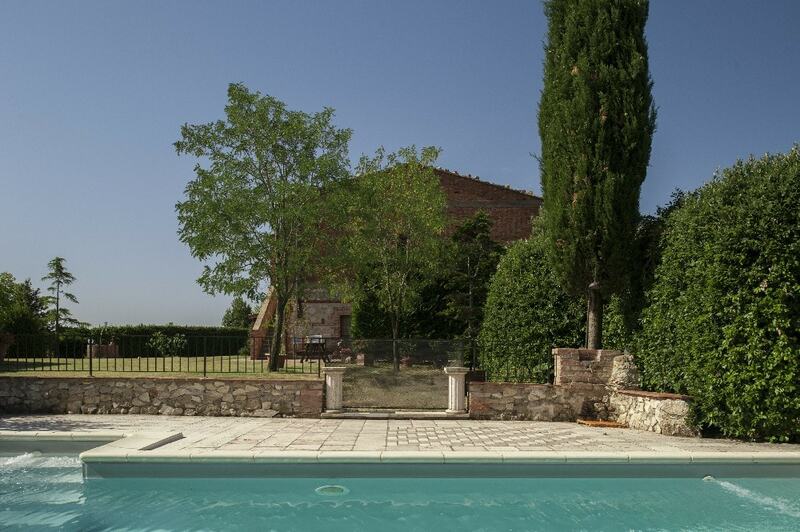 It is only a 10 minutes ride from the Rapolano Thermal Baths, which are open until midnight on Saturdays. 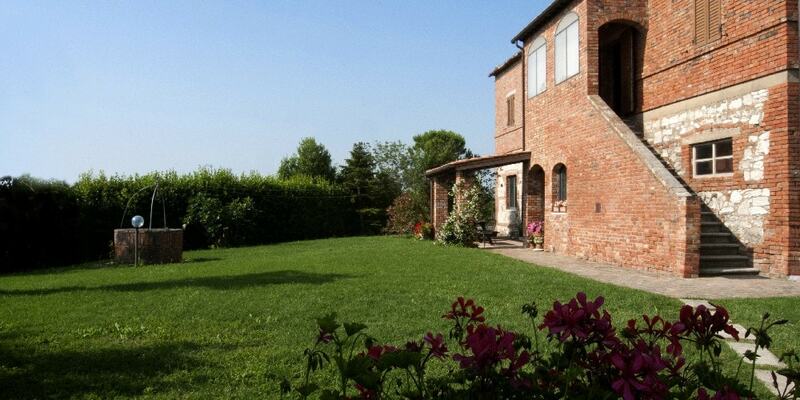 The apartments are all independent and surrounded by fields and vegetation. 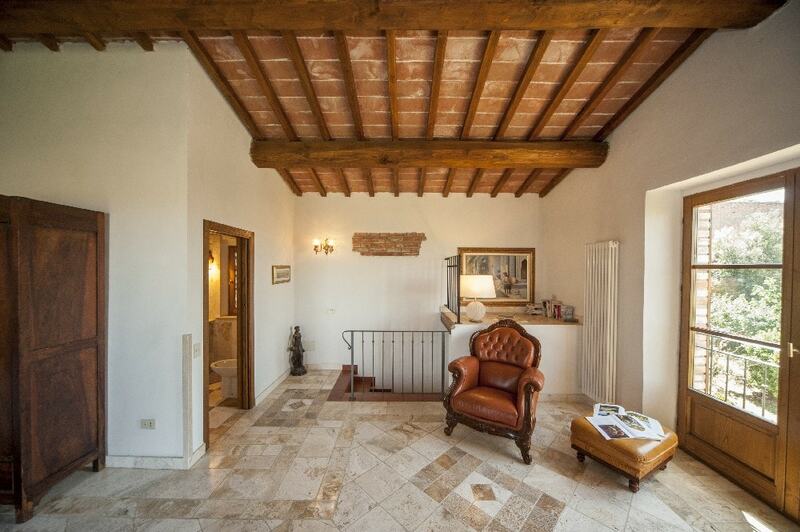 They were refurbished according to the Tuscan tradition, with local materials, wooden beamed-ceilings and antique furniture. 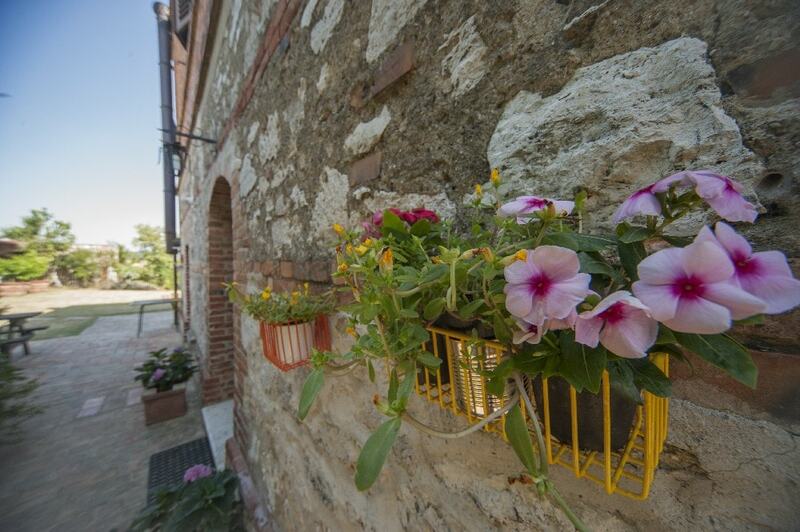 Each apartment has an independent entrance, a veranda and a table for those who wish to eat outdoors. 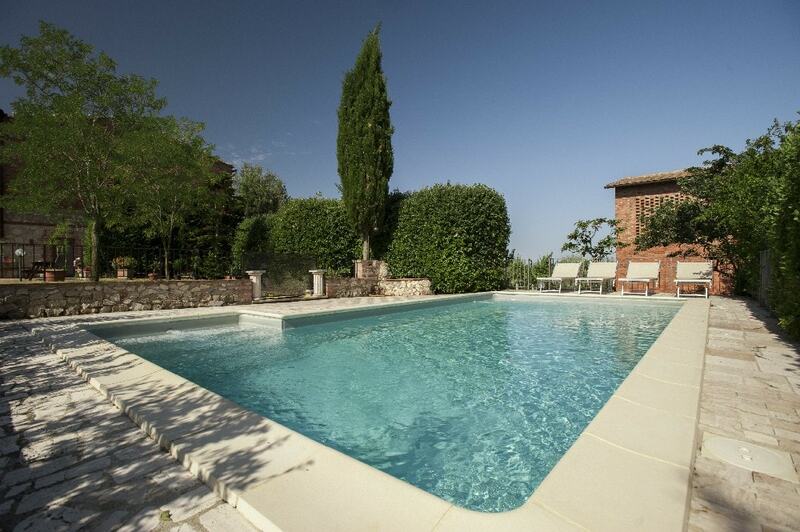 A beautiful swimming pool with sunbeds and a barbecue are available for our guests. 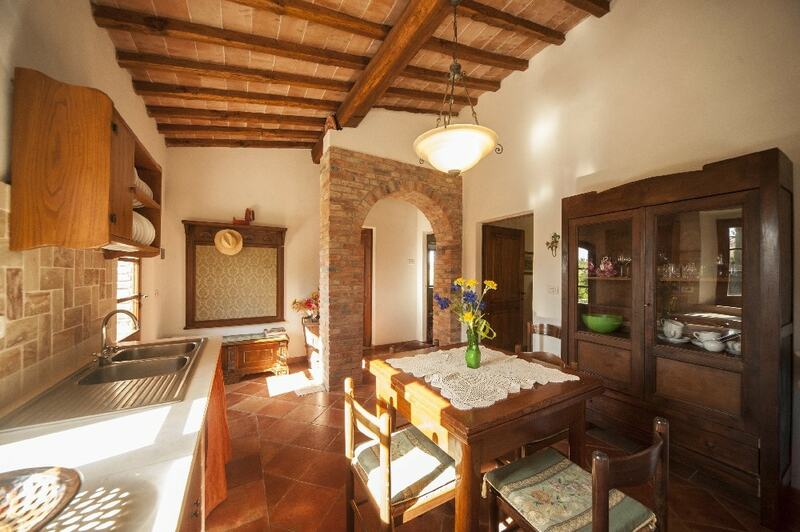 The old barn was refurbished keeping the rustic Tuscan style. 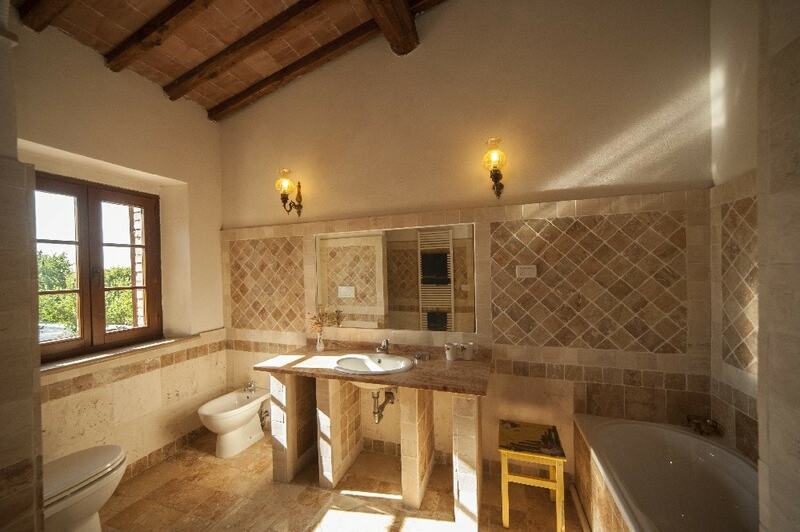 It is very luminous and it offers absolute privacy to the guests. 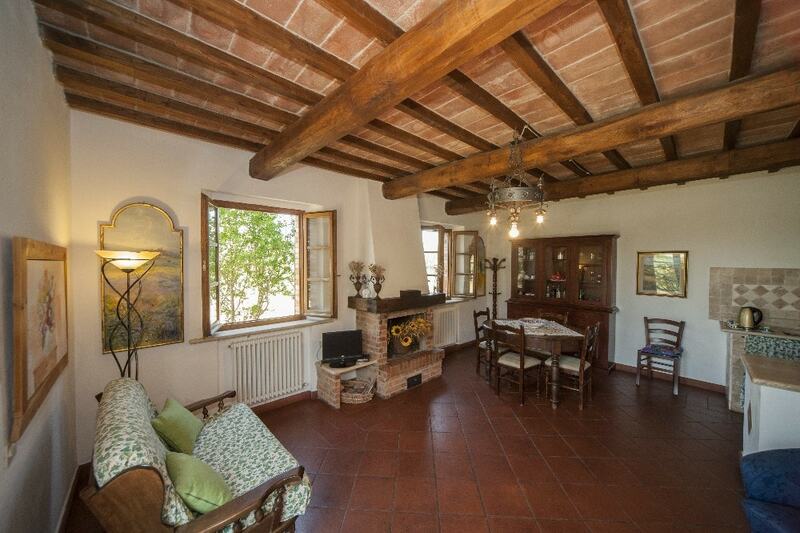 The living room has a fireplace, ideal for the cold winter evenings. 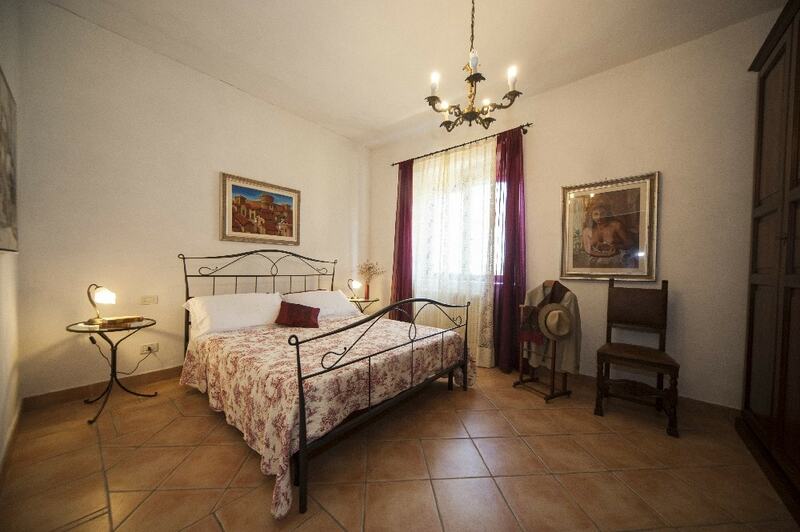 On the first floor there is a spacious and comfortable double bedroom. 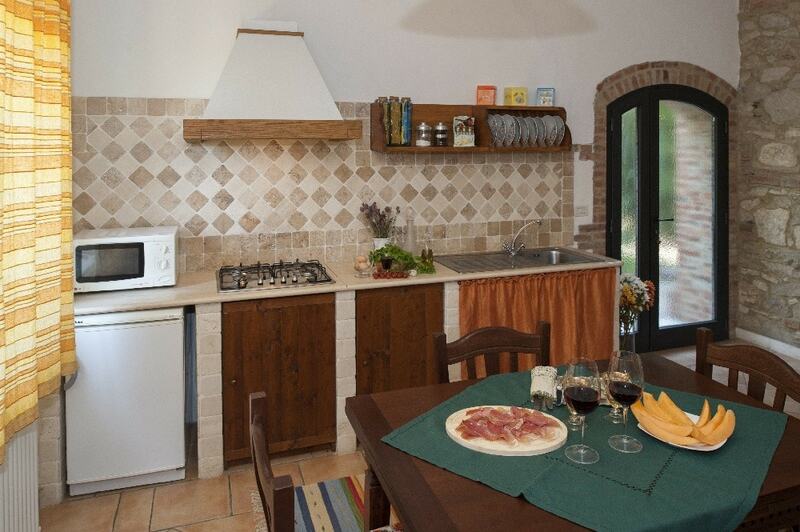 The windows open over the valley with spectacular views of the CollineMetallifere – a group of hills of the Antiapennine. 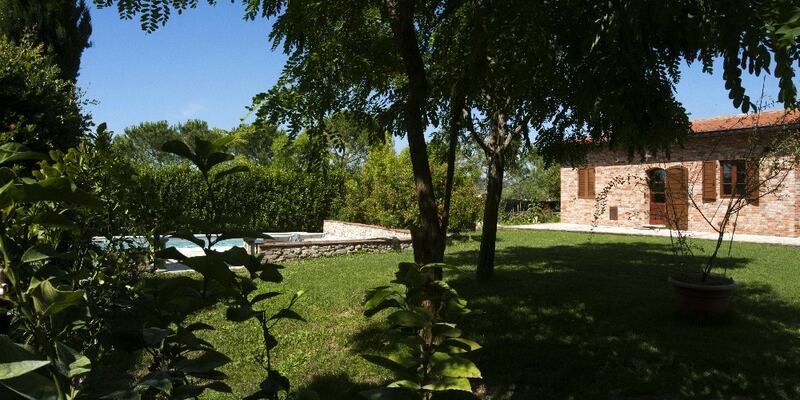 The cottage, also refurbished, is near the swimming pool. 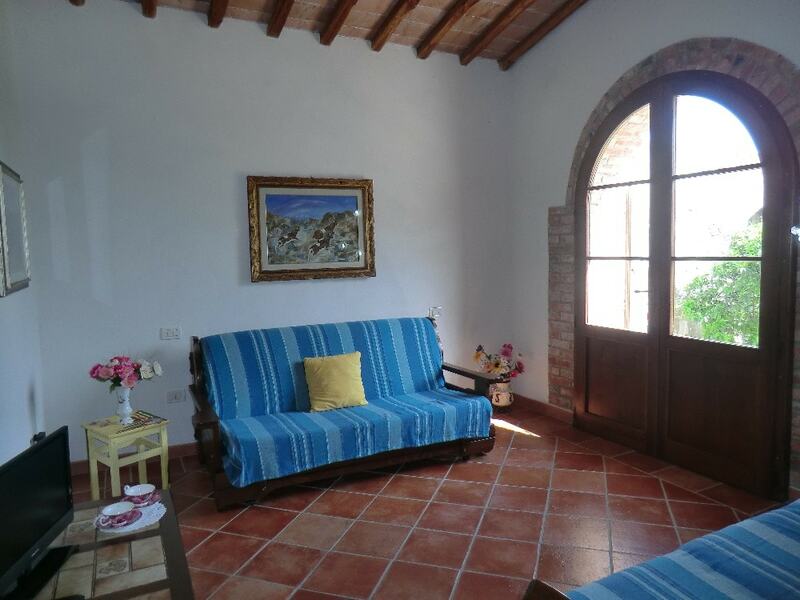 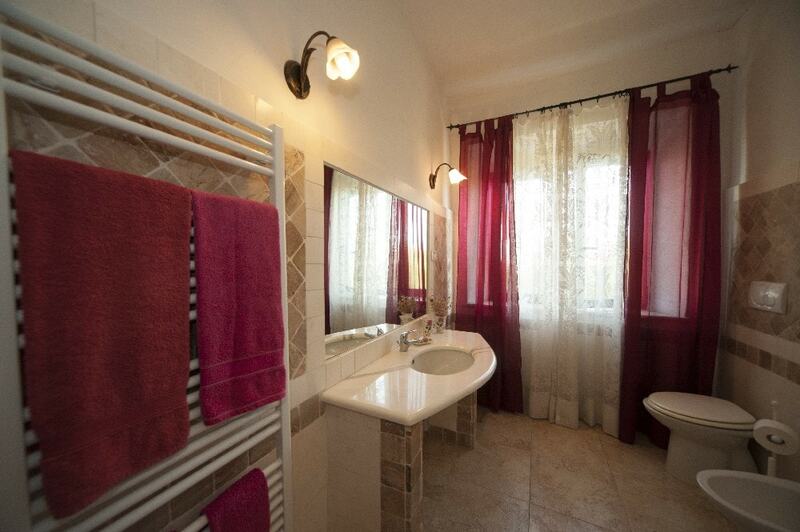 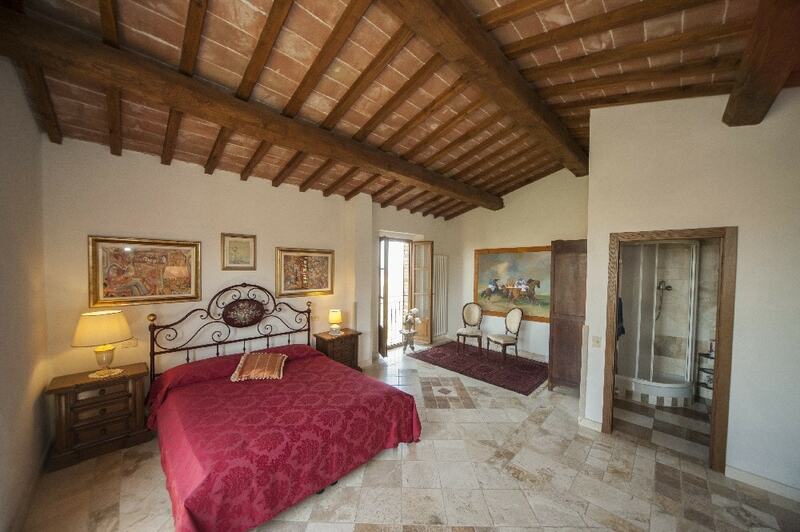 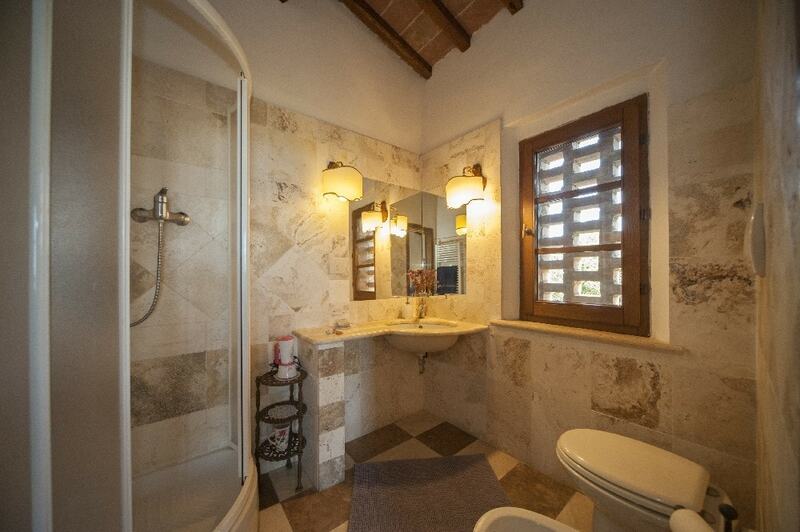 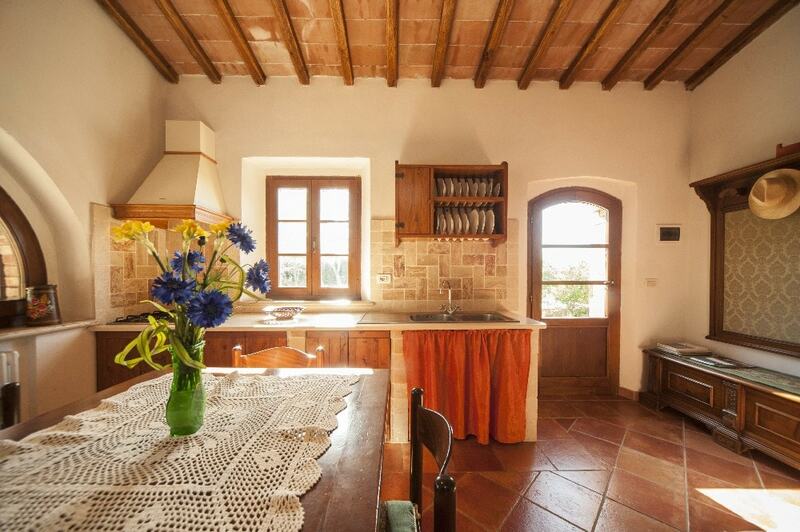 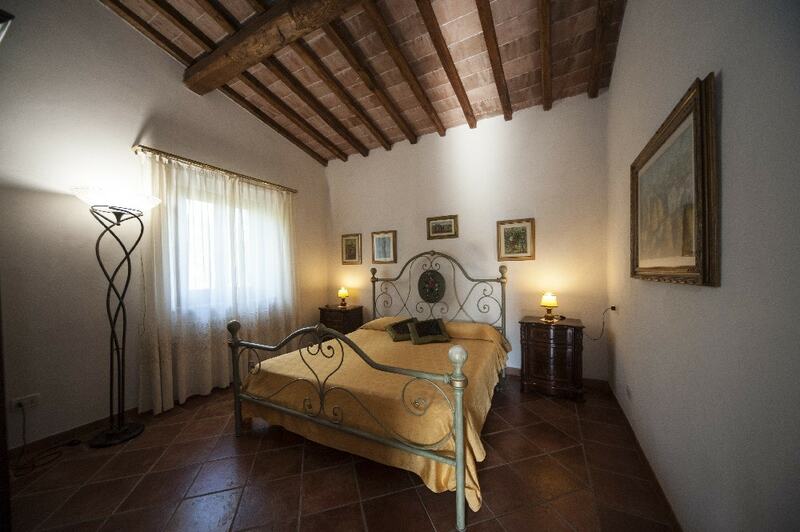 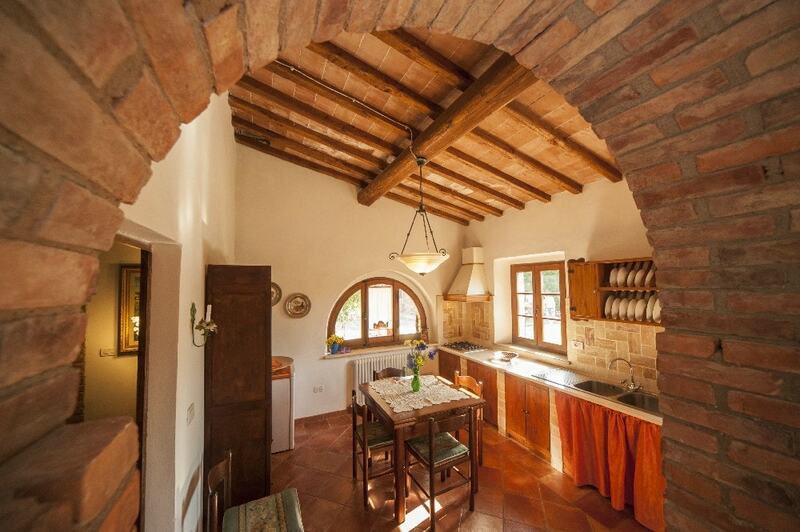 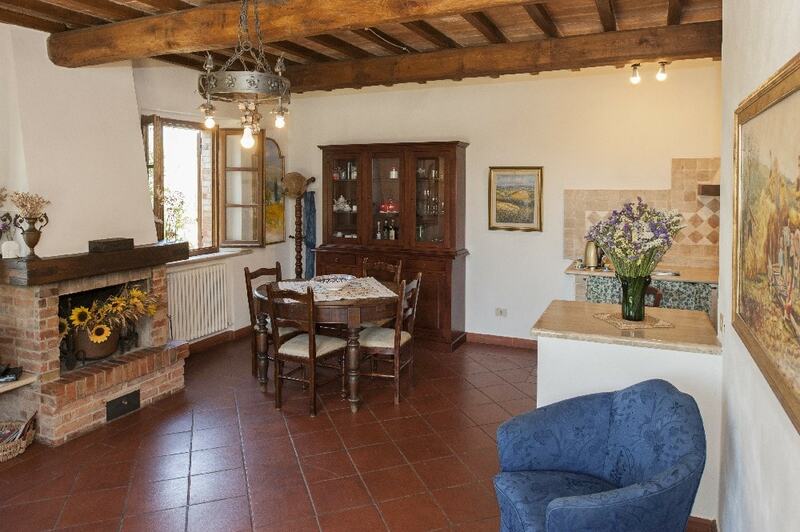 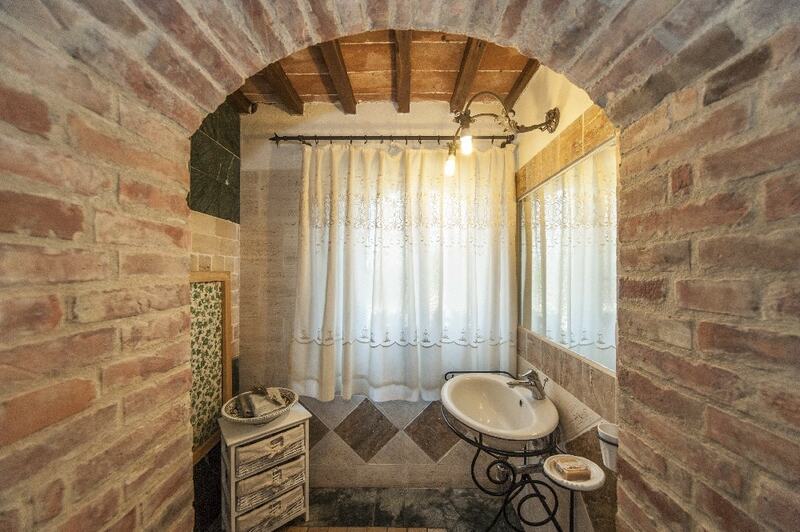 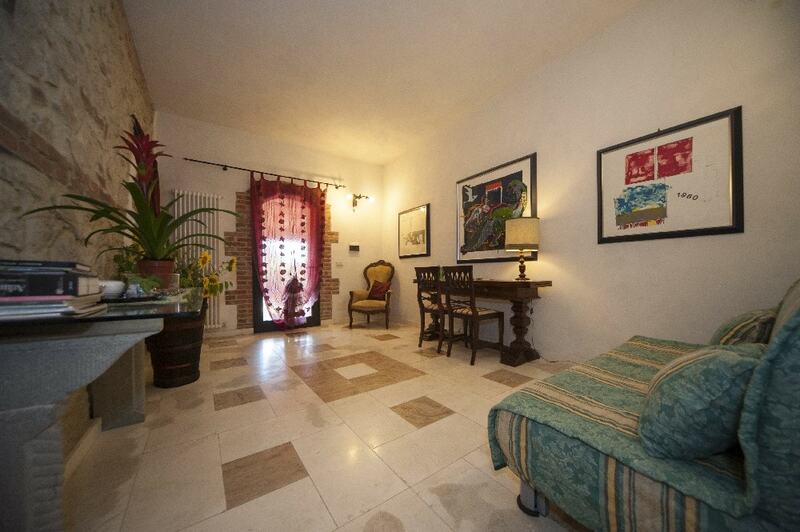 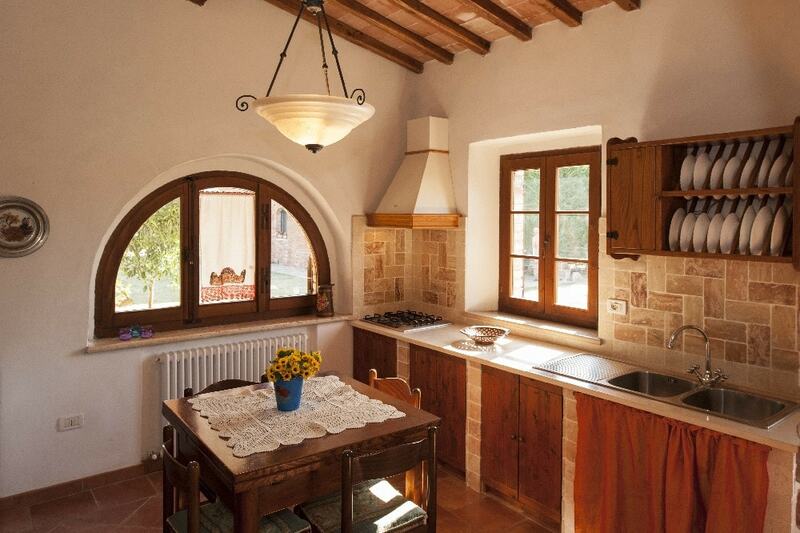 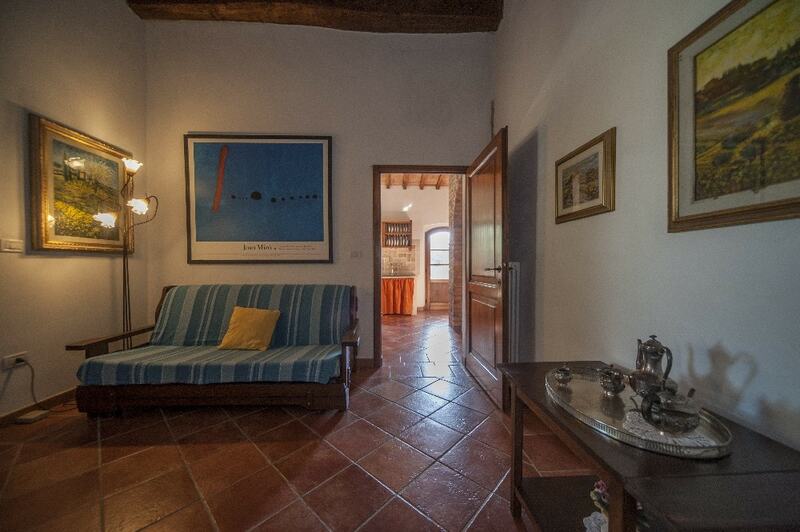 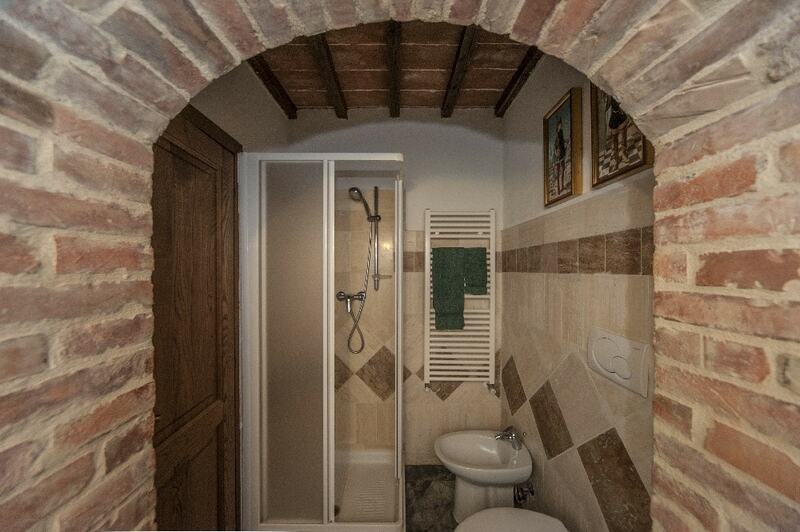 It has a fully equipped kitchen, a bathroom with travertine shower and chestnut timber ceiling. 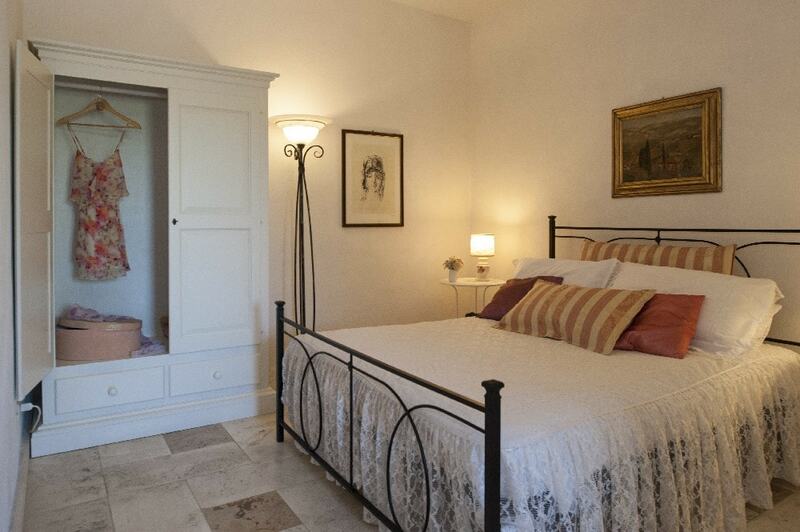 It’s comfortable and very well-kept – ideal for a long stay or a pleasant weekend. 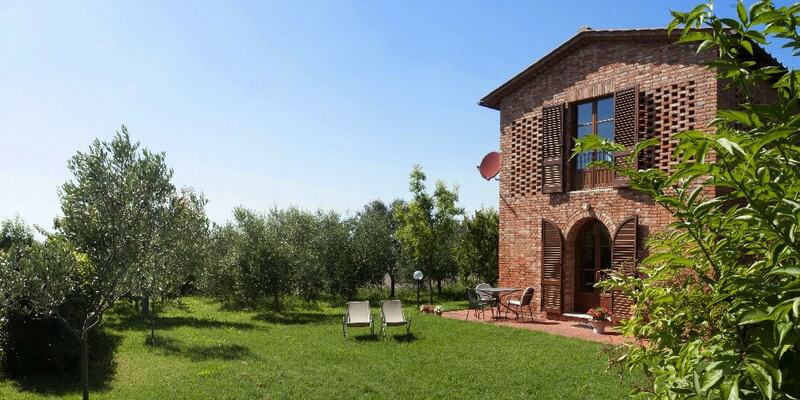 On the ground floor of the farmhouse there is an independent apartment, with windows opening over the fields, where you can sunbath or simply relax under the shade of the trees. 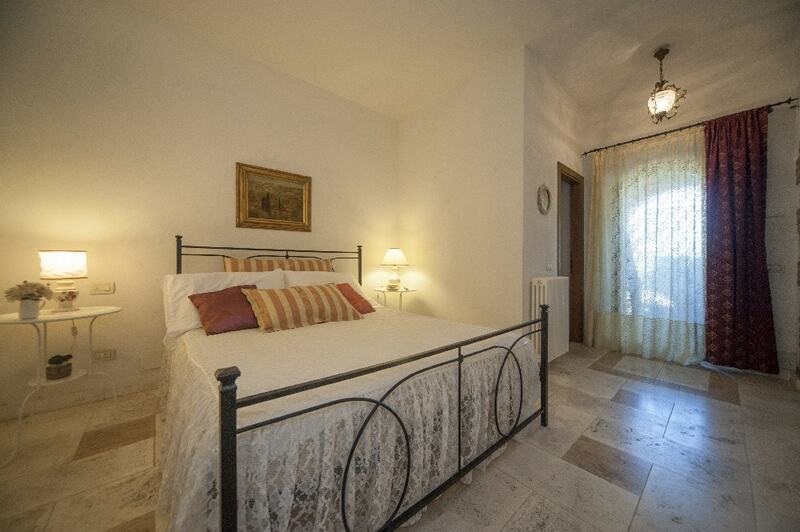 It is complete with bedroom linen, towels and a fully equipped kitchen. 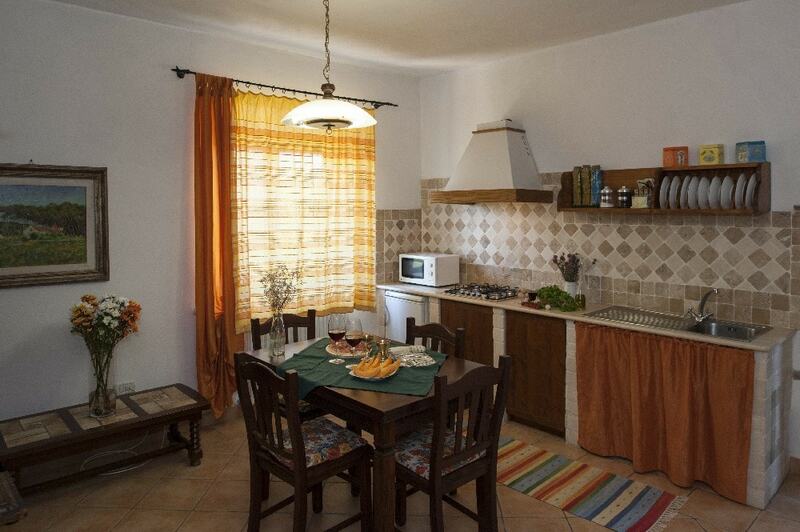 Each apartment has a private barbecue, in addition to the central one. 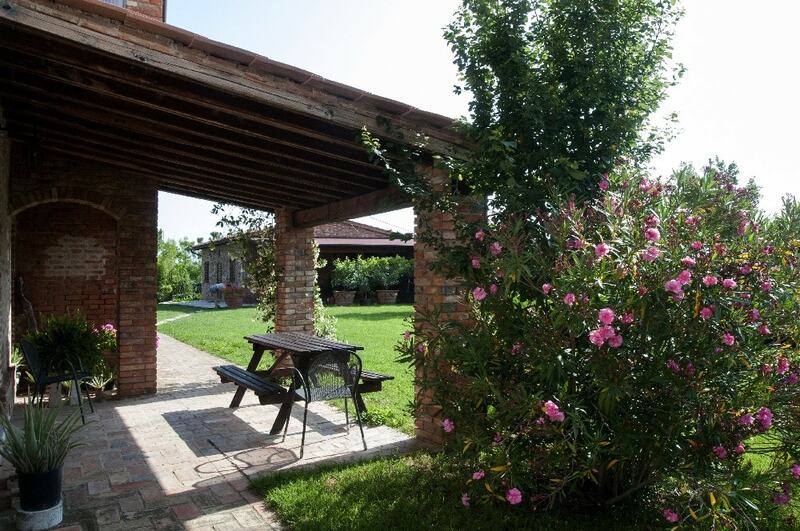 On the grounds of the Holiday Farm there are many quiet spots and verandas, where you can have an outdoors breakfast or just relax, immersed in green and away from the urban stress.